The Norwegian telecoms firm and the SIM and smart card specialist are using an NFC-enabled key fob in combination with a new wireless-enabled SIM to deliver NFC functionality to 100% of today’s mobile phones. 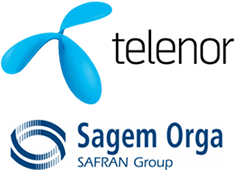 Norwegian telecoms operator Telenor and SIM and smart card supplier Sagem Orga have announced the development of a new method of delivering NFC functionality to existing mobile phones. The new solution uses an NFC-enabled key fob in combination with a wireless-enabled SIM card and, say the two companies, it will work with 100% of today’s mobile phones. Sagem Orga, Telenor and STMicroelectronics are demonstrating the new solution in live payments/ticketing demos at the Mobile World Congress in Barcelona this week. For the demo solution, a key fob has been equipped with a Sagem Orga NFC-enabled SIM card connected by Single Wire Protocol to a ST21NFCA chip from ST Microelectronics to enable the contactless functionality. The NFC key fob connects to the SIM in the mobile phone via a new SIM technology called WLAN SIM that uses WiFi to form the bridge between the NFC device and the SIM card in a mobile phone. For example, a terminal for contactless banking can trigger the mobile payment application stored in the key fob to start a transaction. Next the key fob starts a remote SIM Toolkit execution on the SIM inserted in the mobile phone to enable interaction with the user, such as asking for a password, displaying a message or logging information to the network. With the same key fob solution, the user can also start a SIM Toolkit application on the mobile phone to order new transportation e-tickets. In this scenario, the Calypso vending server would then use the normal OTA infrastructure to send the tickets securely to the SIM and on to the key fob. “The WLAN communication channel between the SIM in the handset and the secure element in the key fob is highly secured and can be protected by a PKI mechanism if needed,” Sagem Orga explains. WLAN SIM, developed by Sagem Orga and Telenor, is the world’s first WiFi-enabled SIM and is designed to combine WiFi functionality on a mobile phone with the security of a SIM card. “The SIM card has always been recognized as the secure element inside a mobile phone,” says Sagem Orga. “However, to date, mobile network operators have not been able to leverage its security features to bring trusted services in the field for fixed-mobile convergence and, in particular, to initiate communications with other proximity devices. Only phone to phone communication is possible, but in many ways such as infrared, Bluetooth, etc, the SIM card is not involved at all. User authentication on a PC is already possible via SIM card, but it would be more convenient to have one general and standardized way instead of different ones for each mobile phone model and provider. *Blush* Now fixed. Good catch, Martin — thanks!